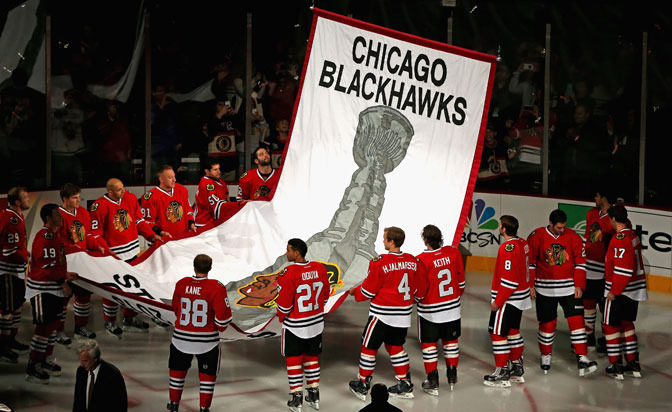 The Chicago Blackhawks will raise another Stanley Cup banner to the rafters at United Center on Wednesday, Oct. 7, when they host the New York Rangers in their home opener on the first night of the 2015-16 season. The NHL announced the home openers for each team Wednesday. The full schedule for the upcoming season will be released Thursday. There will be three other games on Oct. 7: the Toronto Maple Leafs and new coach Mike Babcock will host the Montreal Canadiens; the Los Angeles Kings will host the San Jose Sharks and new coach Peter DeBoer; and the Calgary Flames will host the Vancouver Canucks, a rematch of a Western Conference First Round series of the 2015 Stanley Cup Playoffs. Chicago defeated the Eastern Conference champion Tampa Bay Lightning in six games to win the Stanley Cup for the third time in six seasons. The Lightning's home opener will be Oct. 8 against the Philadelphia Flyers. The Blackhawks will be the opponent in the New York Islanders' home opener and the first regular-season game at Barclays Center in Brooklyn on Oct. 9. Babcock, who coached the Detroit Red Wings for 10 seasons and won the Stanley Cup in 2008, will return to Detroit when the Maple Leafs visit the Red Wings and new coach Jeff Blashill in their home opener on Oct. 9. Forward Connor McDavid, the likely No. 1 pick by the Edmonton Oilers in the 2015 NHL Draft, which will take place in Sunrise, Fla., on Friday (7 p.m. ET; NBCSN, SN, TVA Sports) and Saturday (10 a.m. ET; NHLN, TVA Sports), would make his regular-season debut against the St. Louis Blues on Oct. 8 followed by his home debut Oct. 15 against the Blues. This will be the Oilers' final season at Rexall Place where they have played their home games since 1974. Forward Jack Eichel, expected to be taken with the No. 2 pick by the Buffalo Sabres, would make his debut Oct. 8 against the Ottawa Senators. That will also be Dan Bylsma's first game as coach since he was hired by the Sabres in May. The Rangers, who open the home portion of their schedule Oct. 10 against the Columbus Blue Jackets, will be the opponent in three teams' home openers, tied for most in the League. After the Blackhawks, they visit the Blue Jackets on Oct. 9 and the Canadiens on Oct. 15. The Canadiens will be the visiting team for the home openers of the Maple Leafs, the Senators on Oct. 11 and the Pittsburgh Penguins on Oct. 13. The Winnipeg Jets first home game will be Friday, Oct. 16 against the Flames, which is the latest home opener in the League.